Following a seven-year hiatus, the Breeders’ Cup World Thoroughbred Championships will return to Churchill Downs in earnest on Friday, Nov. 2 and Saturday, Nov. 3 – the highlight of an action-packed Fall Meet at the historic home of the Kentucky Derby that begins Sunday, Oct. 28. The popular 21-day stand, which covers a four-week stretch through Sunday, Nov. 25, kicks off in style Sunday at 1 p.m. (all times Eastern) with the 14th annual “Stars of Tomorrow I” program, which is entirely devoted to hopeful 2-year-old stars that have aspirations of trail-blazing their way to next year’s Kentucky Derby Presented by Woodford Reserve (Grade I) and Longines Kentucky Oaks (GI). Sunday’s 11-race opening day card is headlined by two stakes: the third running of the $300,000 Spendthrift Juvenile Stallion Stakes – a seven-furlong sprint exclusively for 2-year-old offspring sired by any active or non-active Spendthrift stallion, including all Spendthrift-owned stallions standing regionally in North America – and the sixth running of the $100,000-added Rags to Riches Overnight Stakes for 2-year-old fillies at one mile. The 129th Fall Meet will showcase lofty purse levels thanks to early returns from state-of-the-art historical racing machines at Derby City Gaming, Churchill Downs Incorporated’s new $65 million facility that opened in mid-September at nearby 4520 Poplar Level Road. Horsemen will compete for a massive $41,364,500 in prize money offered in Director of Racing Ben Huffman’s 223-race Fall Meet condition book, including more than $29 million for the Nov. 2-3 Breeders’ Cup World Championships programs. Excluding the two Breeders’ Cup days, the average daily purses offered is $648,658, which is a 29.7% jump compared to the $499,959 that was awarded on average at last year’s Fall Meet. For some perspective, the average purse for an overnight race in 2012 – the year before the debut of Churchill Downs’ September Meet – was $32,672. The average purse per overnight race in this year’s condition book is $54,921 – a 68.1% jump from six years ago. Last year, maiden special weights were $60,000; this year they’re worth a record $76,000. Allowance races ranged from $62,000 to $72,000 in 2017; now they are $78,500 to $90,000. And $5,000 claimers will benefit as they chase for a $20,500 purse compared to $18,000 a year ago. As a result, the barn area is at capacity, and the average field size of 8.9 horses per race a year ago could be challenged. The Breeders’ Cup, which will be staged for the 35th time, will return to the historic home of the Kentucky Derby for a record-equaling ninth time. The year-end championship event that debuted in 1984 annually brings together the best horses, jockeys, trainers, owners and breeders from around the world. Some of the event’s most memorable, dramatic and historical moments have occurred here at Churchill Downs – from unbeaten Personal Ensign’s triumphant final 50 yards to beat Kentucky Derby winner Winning Colors in the 1988 Distaff to fan-favorite Zenyatta’s courageous career-ending loss to Blame by a scant head in the 2010 Classic. Alysheba, Arazi, Awesome Again, Da Hoss, Goldikova (Ire), Invasor (Arg), Kona Gold, Miesque, Ouija Board (GB), Silverbulletday, Street Sense and Tiznow are just a few other racing legends that furthered their reputations with extraordinary performances before some of the biggest Breeders’ Cup crowds at Churchill Downs. This year should be no different as Thoroughbred racing’s most prestigious two-day global event showcases 14 races and 13 Grade Is with purses and awards totaling a record $30 million. New to this year’s Breeders’ Cup is “Future Stars Friday” in which all five Breeders’ Cup races exclusively for 2-year-olds will be run on the opening day of the Championships. Additionally, the sixth running of Churchill Downs’ $100,000 Street Sense for 2-year-olds at one mile has been added to the 10-race program that begins at 12:55 p.m. The winners of the two marquee Breeders’ Cup events – the $2 million Sentient Jet Juvenile (GI) and $2 million Tito’s Handmade Vodka Juvenile Fillies (GI) – likely will become the early favorites for next year’s 145th runnings of the Kentucky Derby Presented by Woodford Reserve (GI) and Longines Kentucky Oaks (GI). Championship Saturday’s 12-race spectacular begins early at 10:45 a.m. and will feature nine stellar Breeders’ Cup events that culminate with the $6 million Classic (GI), which is expected to feature a full field of 14. A record 221 horses, including 51 from overseas, were pre-entered Monday, including multiple Grade I winner Accelerate; two-time Prix de l’Arc de Triomphe winner Enable (GB); Roaring Lion, a four-time Group 1 winner in Europe this year; Abel Tasman and Monomoy Girl, the last two winners of the Longines Kentucky Oaks; and Hall of Fame trainer Bob Baffert’s Juvenile standout Game Winner. Twelve of the Breeders’ Cup races are oversubscribed with more than 14 horses in 11 races, and more than the maximum 12 in the new Juvenile Turf Sprint. Over the course of the meet, horsemen will have ample opportunities to uncork promising juveniles or seek year-end graded-stakes glory. All told, 30 stakes races cumulatively worth $30.9 million – which includes 14 Breeders’ Cup races worth $28 million – will be run during the fall stand. Meanwhile, bettors are certain to be challenged by the competitive Fall Meet racing that typically pits the fastest and battle-tested horses against the recently freshened year-end bloomers. Outside of the return of the Breeders’ Cup, the anchor of Churchill Downs’ lucrative stakes program comes on “Black Friday,” Nov. 23 with the 144th running of the $500,000 Clark Handicap Presented by Norton Healthcare (GI). The 1 1/8-mile test for 3-year-olds and up annually lures some of the top older horses in North America and is one of six stakes events cumulatively worth $1.4 million to be contested over Thanksgiving weekend. The final stakes of the meet occur on the Saturday, Nov. 24 “Stars of Tomorrow II” program: the Grade II, $200,000 Kentucky Jockey Club for 2-year-olds and Grade II, $200,000 Golden Rod for 2-year-old fillies. Both 1 1/16-mile events are part of the Road to the Kentucky Derby and Kentucky Oaks series that award points to the Top 4 finishers (10-4-2-1). Inaugurated in 2005, Churchill Downs’ Stars of Tomorrow programs for 2-year-olds have helped launched the careers of numerous graded stakes winners, including more than 50 future Grade I winners led by 2010 Kentucky Derby champ Super Saver; 2011 Preakness and 2012 Met Mile and Clark Handicap winner Shackleford; 2009 Horse of the Year Rachel Alexandra; 2017 Horse of the Year Gun Runner; 2012 Breeders’ Cup Classic and 2013 Stephen Foster Handicap hero Fort Larned; 2018 Kentucky Oaks winner Monomoy Girl; 2012 Kentucky Oaks winner Believe You Can; 2013 champion 3-year-old Will Take Charge; and 2016 Belmont Stakes winner Creator. Corey Lanerie, who rode 38 winners at the 2017 Fall Meet, is seeking to land his 17th riding title at Churchill Downs. Louisville native Brad Cox landed his second Churchill Downs training title last fall with 13 trips to the winner’s circle. Ken and Sarah Ramsey secured their 30th local leading owners title at the 2017 Fall Meet and added No. 31 this spring. After Sunday’s opener, live racing will be conducted on a Wednesday-Sunday schedule with dark days on Mondays and Tuesdays. Most race days feature 10 live races, but there will be 11 on opening day; Saturday, Nov. 10 and Saturday, Nov. 17. Twelve-race cards are scheduled for Breeders’ Cup Saturday and the final four days, Nov. 22-25. Post time will be 1 p.m. (all times Eastern) on most racing days with admission gates open at 11:30 a.m. Churchill Downs will have special post times for the Breeders’ Cup: 12:55 p.m. on Breeders’ Cup Friday, Nov. 2 (gates open at 10 a.m.) and 10:45 a.m. on Breeders’ Cup Saturday, Nov. 3 (gates open at 8 a.m.). Also, there will be an early 11:30 a.m. start (gates 10 a.m.) on Thanksgiving Day – a Louisville tradition at Churchill Downs since 1969 where more than 7,000 turkey dinners are served with all the trimmings, making it the largest number anywhere in the region. Sunday’s opener features a special Halloween Family Adventure Day Presented by Kroger. In addition to Family Adventure Day’s regular fun activities for children to enjoy, Churchill Downs and community partners will pass out more than a ton of candy at 18 “Boo Stations” throughout the first floor of the facility. Because it is three days before Halloween, kids 12 and under are encouraged to wear costumes and trick-or-treat between 2-5 p.m. Adults may wear costumes but masks on adults are prohibited for safety reasons. Other special events during the Fall Meet include the giveaway of a free 2019 Churchill Downs Wall Calendar, presented by Humana, on Sunday, Nov. 11; Military Appreciation Day with free admission for active and retired members of the U.S. armed services on Sunday, Nov. 11; Senior Days with a discounted Millionaires Row offer for seniors age 60 and up on Thursday, Nov. 1 and Wednesday, Nov. 14; and a “Stakes and Eggs” brunch special ($45 for adults and $22 for children) in the Stakes Room every Sunday. The betting menu, outside of the two-day Breeders’ Cup, will be the same as recent meets and includes the 20-cent minimum “Single 6 Jackpot,” which is offered on the last six races each day with a low 15-percent takeout. The Single 6 Jackpot will be paid out only if there is a single winning wager with six winners placed at the required minimum bet value. If there are multiple winning wagers with six winners in the six-race sequence, 90 percent of the net money wagering into the pool will be paid out, and the remaining 10 percent will carry to the Single 6 Jackpot. If there are no tickets will all six winners, 100 percent of the pool will carry to the Single 6 Jackpot. There will be a mandatory payout on closing day. The first pools of the 2019 Kentucky Derby Future Wager will be offered Nov. 22-25. The traditional pool will return, and so will the Kentucky Derby Sire Future Wager, which debuted in 2015 and requires bettors to wager on the winning sire for next year’s Kentucky Derby winner. The other Future Wager dates will be Feb. 8-10 (Pool 2), March 8-10 (Pool 3) and April 5-7 (Pool 4). The lone Kentucky Oaks Future Wager will coincide with Pool 3 of the Kentucky Derby Future Wager on March 8-10. 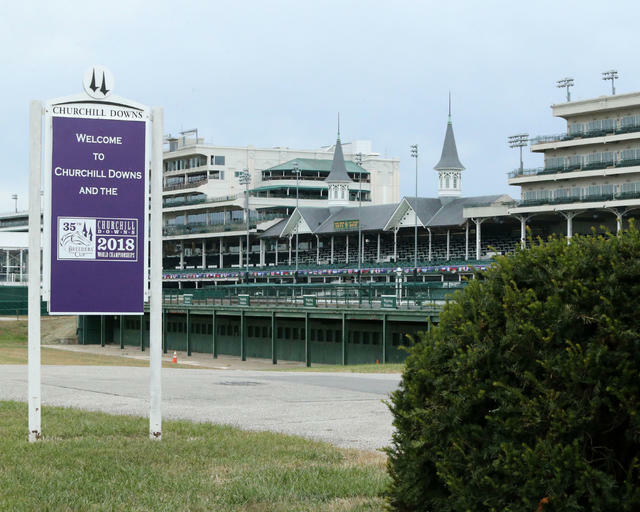 General admission to Churchill Downs is $3 ($30 on Breeders’ Cup Friday; $60 on Breeders’ Cup Saturday; $5 on Nov. 23-24). Outside of Breeders’ Cup, reserved box seats are $10; indoor dining options are $39 ($70 on Thanksgiving and $49 on Nov. 23-24). Children 12 and under are admitted free when accompanied by an adult. Free seating is available over a first-come, first-serve basis in Sections 115-117. Since the Breeders’ Cup was last staged locally in 2011, Churchill Downs Incorporated has invested more than $150 million in the facility to further elevate the experience for all guests and participants. Projects include the construction of Starting Gate Suites; Winner’s Circle Suites; the Grandstand Terrace and Rooftop Garden; the Mansion; the Plaza; enhancements to the Clubhouse, including the second floor, Turf Club and Stakes Room; and the installation of the world’s largest 4K ultra-high definition video board. The most recent capital project, a $32 million plan to improve the parking and transportation experience, reached its conclusion this month. Phase One was completed this spring and resulted in a significantly enlarged and highly efficient transportation infrastructure for Kentucky Derby guests, while also enhancing the overall traffic and parking flow throughout the year. The recent completion of Phase Two will deliver more than 3,600 free parking spaces (not including Breeders’ Cup Friday and Breeders’ Cup Saturday) in the Yellow Lot, which was formerly known as the Longfield Lot. Additional parking information is available online at www.ChurchillDowns.com/Parking. Travis Stone will describe the racing action. Joe Kristufek is the paddock analyst with other special guest handicappers from TwinSpires.com and Brisnet.com.